Relay fielding is standard procedure these days, so when Faf du Plessis pulled a short ball from Suresh Raina firmly between midwicket and long-on, the sight of two fielders converging on it promised a co-operative collect and throw followed by bum taps all round. Rohit Sharma took on the sliding brief but a wrinkle in the outfield caused the ball to bobble up and over him, leading to an ungainly scramble and then a crestfallen frown as it rolled onto the boundary rope. Virat Kohli, the team-mate in attendance to finish the job, was not in the mood for a high five. Du Plessis was beginning to cut loose, taking on India's spinners in a way they have not been accustomed to, when he managed to play on in a fairly unusual way. Ashwin pitched outside leg and got extra bounce as du Plessis went down on one knee to aim a swinging blow over midwicket. The sweep missed but the ball hit him in the ribs before deflecting down on to stumps and tripping the lights. Amit Mishra has weaved a web with his tossed-up legbreaks at the World T20, but South Africa were in no mood for romance and thoroughly trashed his figures. There was still plenty of success for the ball that spins from leg to off, though, as all three of Ashwin's wickets came via the carom ball. The best of the lot was the delivery to dupe Hashim Amla, pitching outside leg and spitting off stump in the eye as Amla played against the turn and missed. R Ashwin bowled superbly, his four overs going for 22 runs and bringing three wickets for India. The third one came off a rank long hop. Ashwin bowled a short carrom ball that pitched outside leg. 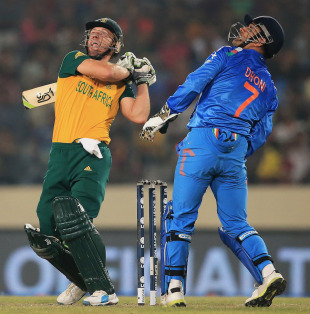 It was so short AB de Villiers had plenty of time to set himself up and hit it anywhere he wanted to. He probably had too much time, for he ended up getting too much under it and skied a pull for the fielder to settle under it at the long-leg boundary. Dale Steyn beat Rohit Sharma with a lovely away going delivery, drawing the batsman forward and moving it past the outside edge. He then waved to the man at deep backward square leg, asking him to move squarer. A short ball was on the cards. It arrived, but outside off stump. Rohit made some room, and upper-cut it over the deep backward point rope.